When you find yourself in a camping situation, there are a lot of factors to think about, and one of them is managing the facilitation of comfortable sleeping. After you’ve figured out where you will sleep, the next step is to invest in a camping pillow. All pillows are not created equally, and if you’re a side sleeper, you will want to have a pillow that suits your needs. Finding the best camping pillow for side sleepers will make your time in nature more manageable. What Makes a Good Camping Pillow for Side Sleepers? Finding the best camping pillow for side sleepers can change your whole experience, considering the benefits associated with sleeping on the left side of the body. However, in order to reap those benefits, you need to make sure that your side sleeping is being executed and supported properly. Easy to Inflate: many camping pillows are made to be inflated once you reach your camp for the night. 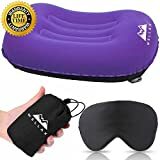 This is very convenient in terms of storage and packing, but unless you make sure that your pillow is easy to inflate, it could turn into an annoying part of your day. Focus on finding camping pillows that are easy to inflate and stay full once filled with air. You don’t want to wake up in the middle of the night with a flat pillow! Lightweight and Comfortable: the ideal camping pillow isn’t too heavy, but still provides the comfort you need to fall and stay asleep. While you may be used to going without normal luxuries while you’re camping or hiking, your sleep is important in keeping you sufficiently energized for survival. Neck and Head Support: all side sleepers know that the number one challenge they face is having enough neck and head support from their pillows without feeling uncomfortable. Look for a camping pillow that is slightly curved for the highest level of neck and head support for your side sleeping needs. Robust and Protective: having a comfortable bed while camping isn’t always possible. You may find yourself facing a night on just a sleeping or even straight on the ground. If you have a camping pillow that is thick and strong, you will protect yourself against resting your head on dirt. Compact: remember that you want your camping pillow to be easy to pack. That’s why choosing inflatable pillows is the most logical option. If your pillow is not inflatable, make sure that it is easy to transport. The Trekology Camping Pillow is an inflatable, ergonomic pillow which is designed to provide support to your neck and lumbar with its curved design. This pillow is an ideal option for side sleepers but will keep you just as comfortable if you choose to transition to your back or stomach. The pillow comes in a collection of colors to suit your preferences and is very affordable. The pillow is made of durable plastic which is water resistant and will protect against tears or popping. Inflating this pillow is super easy and you will be ready to sleep with just a few big breaths. Even if you’re sleeping on less than level ground, your head will not slide off the pillow, as it is made from no slip material. When it’s deflated, this pillow is super compact for easy packing and storing. The Sea To Summit premium pillow is made of polyester knit and is soft and comfortable for your head. There is a synthetic fill between the pillowcase which works to wick away your sweat, keeping you dry while you sleep. The bottom of the pillow is scalloped, making it the perfectly designed pillow for side sleeping, though it is comfortable for back and stomach sleeping, as well. When the pillow isn’t blown up, it folds down to size more compact than your fist. This pillow will stay in place and barely makes any noise even if you move around a lot. The Chillax Camping Pillow is an affordable option that is available in a few bright colors to add a vibrant touch to your survival equipment. This pillow is made with an ergonomic design and a slight curve, creating the ideal angle for side sleeping. Once you place this pillow, it will not slide out from under you. Chillax is concerned with your total comfort and with your camping pillow, you’ll get a soft silk sleeping mask to help get you through the night. With just 3-5 breaths, you will have blown up your pillow and be ready for a good night’s sleep. The Hikenture pillow is another affordable, inflatable option that will provide sufficient neck support for side sleepers. This pillow is super lightweight and when it’s folded down, it fits into a small carrying bag that’s about the size of a can of soda. This pillow is easy to blow up with your own breath and will deflate in a matter of seconds during quick transitions. This pillow is on the larger side and is more practical for ground sleeping than sleeping in a hammock. 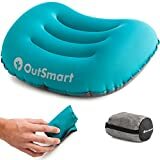 The Outsmart Camping Pillow is an affordable, lightweight option that can be used in a wide range of situations, as it is very durable and water-resistant. There’s no need to worry about popping your pillow while you sleep, it’s built with a strong plastic that doesn’t tear easily. This pillow is comfortable and has a slight curve which makes it a great option for side sleepers. When you’re searching for your ideal camping pillow as a side sleeper, the most important thing to focus on is finding designs with a slight curve that are supportive of your neck. The right pillow will change your camping sleeping experience!